First half goals from Dipanda Dicka and Akram Moghrabi sealed the goals for the Mariners. 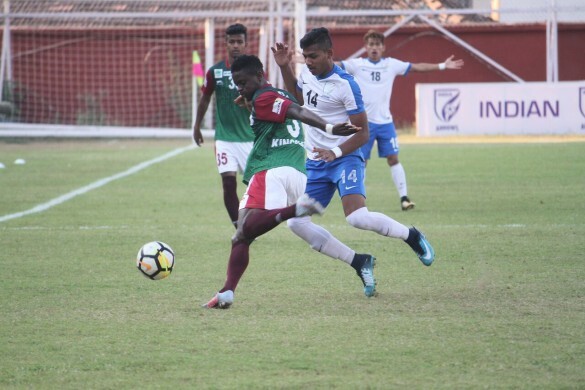 Indian Arrows went down to Mohun Bagan 0-2 in the final hurrah of the youngsters in Hero I-League 2017-18 at the Tilak Maidan, Vasco on Wednesday (February 27, 2018). First-half goals from Dipanda Dicka (26‘) and Akram Moghrabi (41‘) found the back of the net in the first half and these two strikes were enough for the Mariners to keep their title hope alive whose tally reaches to 27 with two games left. 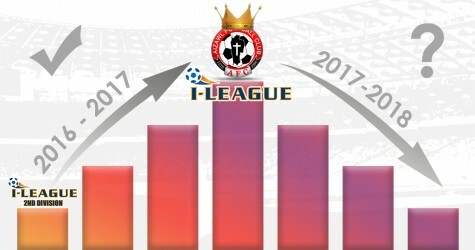 Meanwhile, Arrows who are the youngest-ever team to compete in the I-League history, finish tenth in the league with fifteen points from their 18 outings. In their final game of the season, Luis Norton de Matos rang in five changes from their defeat against Aizawl FC as Jitendra Singh, Amarjit Singh, Rahim Ali, Rahul KP were introduced in the starting XI. As for Bagan, Sankarlal Chakraborty made only one change with Kinshuk Debnath taken off to fit in Rana Gharami in defence. Bagan looked to have come with a plan and Nikhil Kadam, Dipanda Dicka and Azharuddin Mallick all looked dangerous up front. Kadam was spraying balls all around and Dicka kept Anwar Ali, Jitendra Singh and the Arrows backline on their toes. However, Indian Arrows also matched up to Bagan and had their moments with Amarjit Singh drawing a fine save from Bagan custodian Shilton Paul. Rahim Ali was operating up front with bursts of energy and tried a shot from distance that lacked precision. Meanwhile, Bagan showed their clinical edge and Dicka demonstrated why he is such a goal-scoring predator. The forward drew first blood in the 26th minute. Arrows left space between their defence and midfield and Bagan exploited it. Dicka got in behind Jitendra Singh who failed to read a lob down the middle from Cameron Watson. Instinctively, Dicka controlled it, positioned himself and struck an overhead kick on the volley. It was a goal of pure skill as the Cameroonian scored his 12th of the season. Bagan enjoyed the bulk of possession and looked dangerous going forward and doubled the lead in 15 minutes. Sankarlal made a substitution with Gurjinder Singh replacing Ricky Lallawmawma in the 37th minute. Gurjinder made an instant impact as he delivered a pinpoint cross into the six-yard box from the left wing. It begged a touch and Akram Moghrabi, having perfectly slid in, slammed the ball home as the Kolkata giants led 2-0 at half-time. Early in the second half, Dicka had a chance to double his tally. A cross from Kadam found the forward who couldn’t connect cleanly as Arrows were let off. Arrows were growing into the game and a free-kick was quickly worked into the path of Anwar who miscued his shot. They had some promising moments. Deepak Tangri laid off a brilliant ball into the path of Rahul Balan. However, Rahul ended up blazing his shot over the bar, although he had the time and space to make a better decision. There was no late drama compared to the reverse fixture as Mohun Bagan ran out with all three points from Tilak Maidan. The Kolkata giants are left with another outing in Goa as they’ll face Churchill Brothers FC Goa in their penultimate fixture of Hero I-League 2017-18 on March 3, 2018.